Rain nor sleet nor snow could keep most clients away from the salon during this past winters record-breaking snowstorms. Client cancellations, rescheduled appointments, and no-shows in the worst snowstorm in decades nearly brought business at many salons in February to a screeching halt. Nail technicians, competing with bone-chilling temperatures, blizzards, and dangerous road conditions, worked feverishly during the winter snowstorm to keep their businesses afloat. “It was the coldest it has been this century,” says Elizabeth Zarzecki of Joy’s Hair Haven in Baltimore, Md. “For approximately 10 days in February, we had a deep freeze that hurt the salon business because people couldn’t get out. Advisory warnings were issued not to drive unless there was an emergency.” Temperatures dove to 30 below zero, and with wind-chill factors plunged to 50 below zero. “Baltimore was frozen,” says Zarzecki. Many Baltimore residents remained nestled in their homes to escape the snow, freezing rain, and ice that blanketed their city. Salon owners and nail technicians experienced an immediate drop in business. Debi Totten Grimaldi of Hands for Hire in Long Island, N.Y., explains, “People do not like to drive in the snow. Many of my clients live 20 minutes from the ocean, so it was very cold and windy” Grimaldi says she even advised her clients to stay home because the roads were too hazardous to traverse. Many older clients who have trouble getting around and clients who held evening appointments didn’t come in. While most clients were reluctant to drive on icy roads to get to the salon, some took the risk. “I was trying to cancel my evening appointments because I didn’t like driving around in that weather, but my clients wouldn’t cancel.” says Nicole Forest, owner of Nails By Nicole in Chicopee, Mass. “People called me and said, ‘If I don’t come today, how soon can you take me?’” Forest says she only had four no-shows out of 14 appointments, and the four no-shows had been involved in car accidents on the way to the salon. Diane Gamble, owner of A Total Experience in Baltimore, Md., says some of her clients have to get their nails done, regardless of the weather. “My clients can’t live without it,” she explains. One of the most common problems clients experienced — besides missed appointments — was brittle nails and dry hands and cuticles. They also experienced nail mishaps due to tasks they had to complete because of cold weather. “Nails don’t hold up as well in cold weather,” Farquhar says. “Clients come in after they’ve been scraping ice off their car windows and building fires.” Their nails have taken a lot of abuse, he says. Clients also found their acrylic nails crystallizing in the cold. 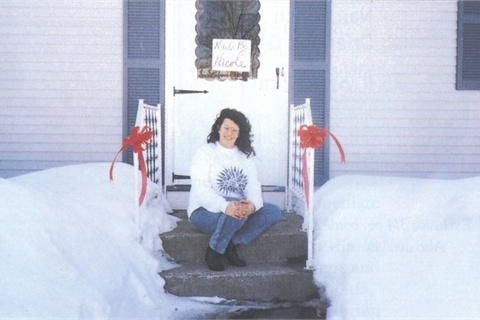 “Acrylic freezes and cracks,” says Sandy Norris, owner of Sandy’s salon in Kernersville, N.C. If you file or buff the acrylic nail while the hands are still cold, the acrylics come right off the nail, she says. You have to warm your client’s hands before applying acrylics. Stress was another common problem, says Grimaldi. Some of her clients suffered from dehydration and hypothermia. Many of them came to the salon tense, complaining about the cold. Like Grimaldi, several nail technicians discovered that simply keeping an open ear helped calm their clients. Nail technicians say their number-one goal during the extreme weather was to accommodate clients and help reduce their stress. For some, that meant having coffee and hot chocolate available; for others, it meant keeping the front of the salon salted so clients didn’t slip and fall. Farquhar says he also had to work more days out of the week to accommodate his clients who rescheduled their appointments. “If I have to do it, I have the do it,” he says. After working long hours, accommodating demanding clients, and fighting freezing temperatures, some nail technicians took special precautions to keep themselves from getting sick. If your clients have been having trouble maintaining healthy skin and nails in the cold, here are some suggestions from nail technicians on treatments you can give clients when the next winter storms in. Massage. For clients with extremely dry skin, try massaging their cuticles, hands, arms, legs, and feet a little longer than usual. Hot oil treatments. Zarrzecki dips her clients’ nails in hot oil to help moisturize the cuticles. Lubricant. Advise your clients to use hand cream several times a day between salon visits. Paraffin wax. A paraffin bath for the hands and feet will remove dead skin and leave your client’s skin baby-soft. Petroleum jelly. It’s an age-old, effective method of locking in moisture, and one of the most inexpensive. Advise your clients to apply petroleum jelly after moisturizing on a regular basis to avoid dry skin. Rub around the cuticle areas and underneath the free edge to prevent breakage. Wear gloves. Advise your clients to gloves between salon visits. The gloves will keep their hands warm and help prevent the acrylic from cracking. Use a heating pad. It’s a fast, efficient method of warming clients’ ice-cold hands in the salon. Aromatherapy. “The oils help with breathing,” says Debi Totten Grimaldi. A lot of women have respiratory problems due to the cold weather. Aromatherapy also helps to reduce headaches while calming the mind, she says. Grimaldi advises her clients to use aromatherapy oils in their baths to help relieve stress. Nutritional supplements. Grimaldi advises her clients to take daily supplements, including amino acids, minerals, and herbs. “Clients can be less stressed with proper nutrition and herbs,” she says. Supplements help with a variety of ailments.